Rarely a day passes without a reminder that, in 2012, Republicans are steamrolling the competition in the dash for super-PAC cash. According to a new analysis by the Sunlight Foundation, GOP-aligned super-PACs have raised $227 million for the 2012 elections, while their Democratic counterparts have raised $77 million—a nearly 3-to-1 advantage. Not startled? 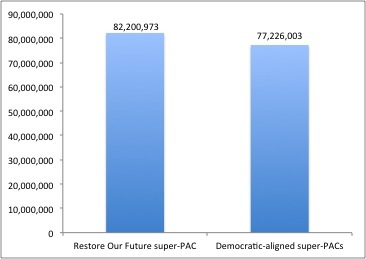 Then consider this: A single Republican super-PAC, the pro-Romney Restore Our Future, has raked in more money this election cycle ($82 million) than all Democratic-aligned super-PACs combined. That’s one super-PAC beating hundreds of competitors. Restore Our Future’s donor list is a who’s-who of GOP mega-donors: Texas homebuilder Bob Perry, casino tycoon Sheldon Adelson, energy executive Bill Koch, hedge fund gurus John Paulson and Paul Singer, and financier John Childs. The Romney super-PAC is run by the savvy operatives Carl Forti (whom the New York Times recently dubbed “the $400 million man of the 2012 cycle”), attorney Charles Spies, and attack-ad specialist Larry McCarthy. At this point, it’s highly unlikely that Democratic-aligned super-PACs will catch up with the big guns on the other side. Then again, when it comes to the presidential race, Democrats don’t need to play catch-up. There’s only so much money the candidates’ campaigns and outside groups can spend to sway voters, especially those in battleground states, before the money stops having an impact on voters flooded with messaging. Priorities doesn’t need to match the GOP money machine dollar for dollar; it needs to hold its own in the states that matter and get its message out while voters are still receptive to what’s on their TV or computer. If Priorities wants to do that, it needs to reach its $100 million fundraising goal (or close). From the look of things, that’s a big if.